Pills facilitating the efficiency of a slimming diet, it is a food supplement 100% of plant origin. 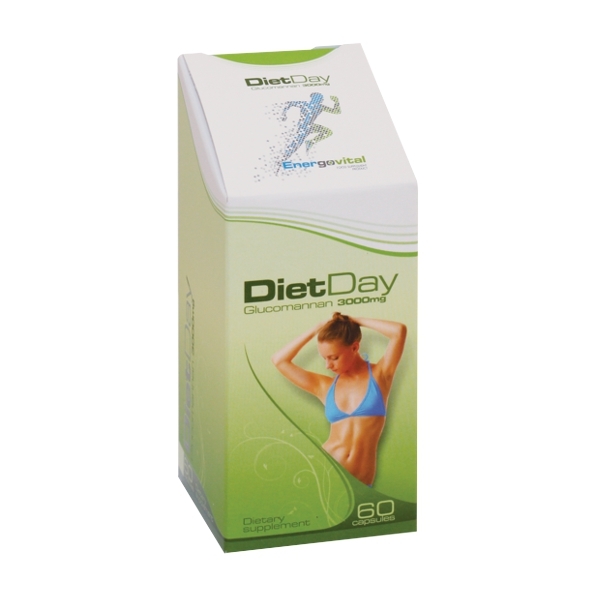 Diet Day is a food supplement made of 100 % natural ingredients that can help reduce body weight, maintain normal cholesterol levels and solve constipation problems. The active substance of Diet Day is glucomannan which is the vegetable fibre extracted from Amorphophallus konjac, its volume can expand multiple times. This attribute is used for complementing diets and weight loss. Glucomannan can retain large quantity of water, as a result it expands, therefore less food is necessary for reaching satiety. We eat less, but we feel satiety instead of hunger. Its use does not have to be restricted to a special diet, it can be used during a normal, regular diet, but we will noticeably eat less, thus less calorie intake will contribute to a successful weight loss. Since this vegetable fibre cannot be absorbed, it reaches the intestines without degradation, and here it retains part of the fats and carbohydrates and reduces their absorption. Besides as it expands in the intestines it resorbs excrements on the intestinal wall, thus it cleans harmful substances from the intestine. We not only recommend this product to people who would like to lose weight, but for those who suffer from diabetes and for people with high cholesterol. Diet Day slows down the absorption of food, thus in case of diabetes a meal generates lower blood sugar level rise, and thus the disease can be better controlled. Furthermore researches have shown that the consumption of glucomannan is related to reducing LDL („bad”) cholesterol level and increasing HDL („good”) cholesterol level. The pill is recommended to be taken before eating with one or two glasses of water, thus it helps maintain or reduce body weight. Its occasional use can help in case of constipation. Fibre intake facilitates the dilution of faeces and demonstrates result within 12 hours without causing diarrhoea. Diet Day is recommended for those who search for a reliable product, since this product has been examined and approved by the University of Szeged Institute of Pharmacognosy. Choose Diet Day if you would like to lose weight and if you want to normalize your cholesterol and blood sugar level as well by taking only one type pill.